The Criterion Hybrid Profile has been a solid performer for my modern rifle build, and has exceeded my expectations on several fronts. Criterion’s Hybrid profile barrel is advertised as having “extreme accuracy without the added weight of a HBAR contour”. I spent a few sweaty days in my gun-room loading up 3 loads accurate to the grain via a powder trickler and beam scale. I then chose a fourth loading, a factory Hornady Soft Point, to round out the testing. Ten round groups are a solid (statistically speaking) means to measure barrel, ammo, and shooter performance. A ten round group gives us enough data to better evaluate accuracy and precision. The 10 round sample size is important as we all know almost any barrel could seem to be “match grade” via the cherry picking of statistically insignificant 3 round groups. Ten round groups also diminish the impact of flyers as a single flyer on the mean radius would represent only 1/10 of the group size. For these 4 groupings, I used a bench and a standard Caldwell shooting rest. Hornady 75 grain HPBT with 24 grains of Varget. The ten round groups paint a story of a highly accurate chrome lined barrel. The max, or extreme spread, measures the distance between the two furthest points in the group. This is a data point that could be skewed by a true flyer, but never-the-less is included as it a very common data point and easily visualized reference. The problem with this method is that it factors in the two furthest points and takes no consideration of the other bullets as data points. The mean radius measures the distribution of the group as it relates to the mathematical center of the group. This method averages all 10 data points to determine the overall average group size as it relates to the center. I am happy with the performance of both Varget loadings and Hornady ammunition. Both the 75 and 55 grain products are highly accurate loadings that represent what shooter and barrel were able to accomplish. With a mean radius of .536 MOA for the 75 grain and .448 MOA for the 55 Vmax, these loadings represent two loadings which excel in the barrel. In particular, I believe the 75 grain loading would accomplish all reasonable short and long-range goals I could hope to achieve with this rifle. 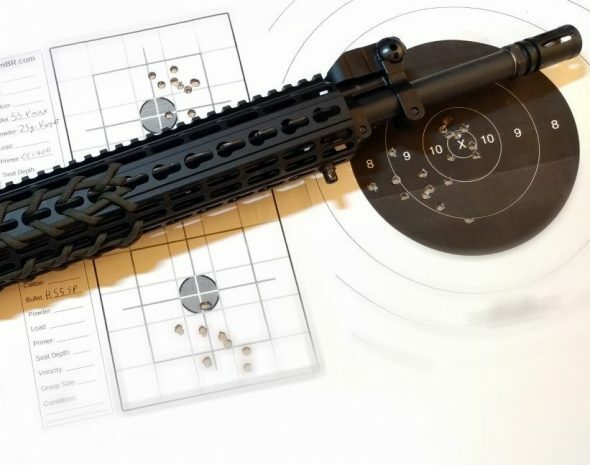 The 6mmBR target is a simple design which features a crosshair, center aiming point, and 1 inch grid squares. For reference consider that the black circle traces just perfectly around a quarter. This sample size can also be compared to what the team over at science of the gun achieved. Of note is the zero shift between each group is about a minute or so. Continue to consider the Criterion Hybrid Profile barrel for your future practical rifle builds. Word is getting around that Criterion makes an excellent barrel. These data points will be compared vis-a-vis after this barrel assembly returns from Teludyne Tech whereby they will apply their “Straight Jacket” barrel system for a before and after accuracy evaluation. I have one extra grouping I did not showcase here… a rapid fire 20 round group of XM193 that you can see on the lead photo. That’s for comparison when I receive the SJ system back. The Criterion product certainly excels on several fronts: It is chrome lined. It is a tapered profile so there is weight savings vs SPR and HBAR assemblies. With accurate loadings it can produce mean radius groups that are running at about 1/2 half a minute. What’s more to say? An excellent product speaks for itself. Good stuff .. I’m happy for ya. With a 75 grain bullet, 25.2 grains of AA2520 in a lake city case is damn near a miracle worker. I watched that load put up a 5 shot ragged hole out a white oak armament barrel. My .gov BCM will put up 10 shot 1.5’s with that load. I can’t wait to try out that load with my new criterion hybrid profile. Report your data brother. Can’t do any more than that. If people don’t care for mean radius you can share both but I love seeing the MR reporting. The other day my Criterion hybrid profile chrome lined barrel arrived. I got it all mounted up last night and took it to the range today. I don’t have a load worked up, yet but I used some 62 grain BTHP’s I loaded for my 20 inch BCM just to function check it, get it on paper, and get out of the house. I wasn’t expecting much in the accuracy department since I was shooting a load for another rifle. Consistency (regardless of group size) and function was all I cared about today. When I actually work up a good 75 grain load for this barrel I have no doubts I can get bellow 3/4″. Since its not much heavier than a .gov profile ( think .750 from end to end with a slight taper behind the gas block) it will give some heat related accuracy issues. It just takes longer. As great as this barrel is, its not a competition barrel like Compass lake, or white oak armament. To be fair I didn’t expect it to act like one either. This barrel has the carryability (is that even a word) those barrels don’t and it still consistently shoots under MOA . THATS WHAT I WANTED WITH THIS RIFLE!! So after the first 160 rounds, Its stacking up to be a real shooter. I just wish I would have picked one up sooner. Next on the list is one for my .308 AR. I’ll post a review when I get that far. As a side note, the folks at Criterion told me that depending on my shooting schedule, I can expect a service life anywhere 17,000 to 20,000 rounds baring abuse and excessive mag dumps. Now if they define service life the same way I do. (the amount of time it will hold its best accuracy) this is the best barrel money I have ever spent.